Bill Maher didn’t shy away from poking fun at Chris Christie when he guested on Friday night’s “Real Time,” telling the portly former New Jersey governor he may have “done one or maybe two jokes” about him. Christie played along. “But you’re still in second place behind [David] Letterman on the fat jokes, so you’ll be fine,” he smiled back. “Fat joke — I hadn’t thought of that angle,” Maher teased, asking if it was OK to tell what he thought was his best joke made during Christie’s 2016 presidential run. Christie encouraged him to do so. Maher said: “Chris Christie can’t run, he has skeletons in his closet — of cows.” That drew a moan from the audience. Christie remembered back to when he was in office and Letterman made a joke about him after Super Bowl Sunday. “When he came back from Super Bowl weekend, he said, ‘This weekend, two million pounds of chicken wings were eaten… and that was just at Gov. Christie’s house,'” Christie said. Now that one the audience liked. Watch the exchange and the full interview with Christie in the video above. 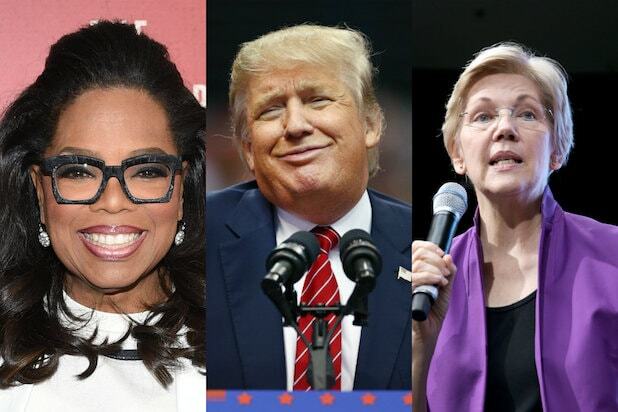 Oprah Winfrey's Golden Globes speech inspired stars, including Meryl Streep, to endorse their candidate -- even though the entertainment mogul isn't officially running... yet. With the next election cycle on the horizon, bookmakers are asking who might challenge President Trump in 2020. The website betonline.ag shared its current odds on who will next win the White House. Rubio earned the nickname "Little Marco" from Trump during the Republican primary. Would he think to challenge his own party by running again? Klobuchar is a senator from Minnesota and another democratic rising star. The governor of New York has frequently feuded with Trump and his sons. "I think there is a place for somebody who is socially a centrist, but I'm fiscally conservative," Cuban said on Fox News back in October, hinting he may run, but as a Republican. When Ryan was reported to have his sights set on retiring as Speaker of the House, the White House denied it and suggested Trump and Ryan are working together just fine. Obama's Secretary of Housing and Urban Development is a Texas native, the former mayor of San Antonio and is considered a rising star among Democrats. "The Rock" teased a presidential run in one of his "SNL" stints, but he may be smart to consider a vice president spot after hearing Oprah's Golden Globes speech. The former New York mayor's name was also floated back in 2016, but his odds are down from 33/1 since then. Conservative pundit Ben Shapiro has suggested he may stage a run for president in 2020. If we know one thing about his possible candidacy, it's that Rosie O'Donnell won't be stumping for him. The New York senator pushed back hard at Trump after he suggested that she was a "flunky" who "would do anything" for campaign contributions. The Silicon Valley CEO disputed Trump's tweet that Facebook was biased against him, but has been focusing his attention on eliminating Russian trolls' influence over the site. “Why don’t you want our kids to have good food at school? What is wrong with you and why is that a partisan issue," the former first lady asked of President Trump, just one instance of how she's challenged the current administration. Currently only 48, Booker is one of several young democratic hopefuls who could challenge Trump in 2020. Elizabeth Warren is still a popular candidate, but the list of young, Democratic contenders is deep. The Vermont senator would be 79 in 2020. Would he run again? The odds for Trump's VP are predictably the best among other Republican contenders. The first-year senator from California has earned a lot of points in the last year thanks to her persistence in grilling Jeff Sessions in front of Congress. Biden has been the most vocal about talking down 2020 rumors compared to his fellow Democrats, but he's also been among the most vocal against the current administration. And a new poll shows him beating out Trump by more than even Oprah. Oprah's odds rocketed up after her inspiring Golden Globes speech, and her odds have improved from January 8 when she was listed at 20/1, but it's still anyone's guess as to whether she'll actually run. Well, he is the president.